The information presented at Cancerwisdom.net is our personal experiences with and opinions about cancer. We’re not health care providers. We make no warranties of any kind with respect to its contents. Cancerwisdom.net disclaim all such representations and warranties. In addition, Cancerwisdom.net does not represent or warrant that the information accessible via this homepage is accurate, complete or current. The statements made about products and services have not been evaluated by the U.S. Food and Drug Administration. They are not intended to diagnose, treat, cure, or prevent any condition or disease. 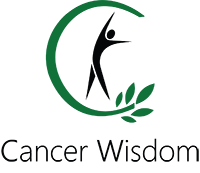 Please consult with your own physician or healthcare specialist regarding the suggestions and recommendations made on Cancerwisdom.net. Cancerwisdom.net will not be liable for damages arising out of or in connection with the use of this homepage. This homepage is not intended as a substitute for consultation with a licensed healthcare practitioner, such as your physician. Before you begin any healthcare program, or change your lifestyle in any way, consult your physician or other licensed healthcare practitioner to ensure that you are in good health and that the information contained in this home page will not harm you.